Round or square necks are mainly used with steel sleeper assemblies together with rail clips. Assembly with heavy series nut and spring washer optional. Nowadays many cities in China, including medium ones, are building their metro transits. Government budget on this is quite big. 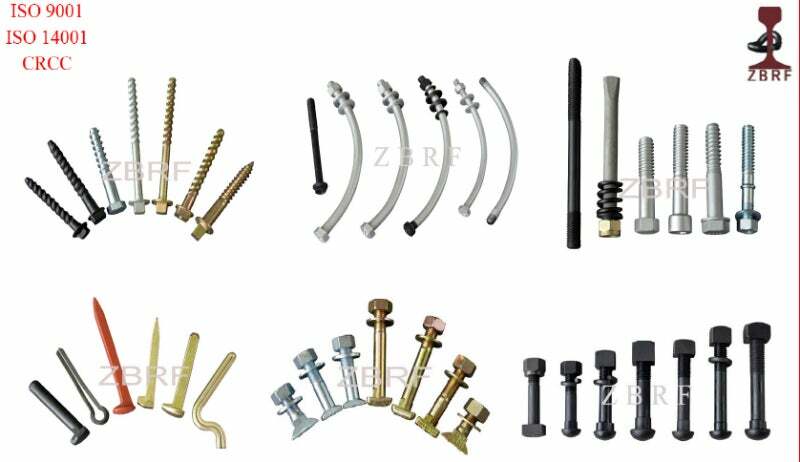 Zhongbo has bidded and gained many such tenders, including straight and curve bolts for connecting function. Dimensions include 3 / 4-10 UNC2A, M24 and M30. We manufacture BHON Track bolt, BHDN Track bolt for all sizes of rails from 0.5in through 1in-0.125in, according to Standard AREMA/ SAE J429, ASTMA-183, AS1085.4-1999, in Grade Gr2, Gr5, Gr8. Fish bolts according the BS standard. These fish bolts can be manufactured to mild steel or high-tensile steel Grade 8.8 as well as the latest Transnet specifications. Metric and imperial sizes are available and are used for fish plate. Zhongbo provides track and dog spikes according to ARMEA specifications. The spikes used for BS80LBS, 75LBS and 90LBS rails, and available in dog-eared and sheared patterns. Dog spikes with square shanks are offered as per AS1085.8, as well as round shanks for the Australian market. Sizes range from 16mm to 170mm. A rail screw spike, also called a sleeper screw, rail screw or lag bolt, is a medium or large metal screw used to fasten a rail base plate or rail. Such spikes are always fastened into holes bored into the tie sleeper, sometimes together with imbedded plastic dowels, popularly used for rails with wooden sleepers, especially in America and Canada.